Formulated to rescue skin from external aggressors like harsh weather and provide comfort after dermatological procedures and surgeries, Pure Cloud Cream pampers and calms seriously stressed skin. Fragrance-free and dye-free, Pure Cloud Cream offers intense hydration, helps relieve skin irritation and discomfort, and helps heal skin. Peptides help stimulate the release of feel-good endorphins and relieve skin irritation. Oat Extract reduces discomfort after skin trauma. Almond oil moisturizes skin, and is rich in vitamins A, B and E.
Water/Aqua/Eau, Aloe Barbadensis Leaf Juice, Hydrogenated Didecene, Angelica Archangelica Root Water*, Sodium Hyaluronate, Acetyl Dipeptide-1 Cetyl Ester, Prunus Amygdalus Dulcis (Sweet Almond) Oil, Canola Oil, Hydrolyzed Rice Protein, Bisabolol, Buddleja Davidii Extract, Thymus Vulgaris (Thyme) Extract, Simmondsia Chinensis (Jojoba) Butter, Oxycoccus Palustris (Cranberry) Seed Oil, Rubus Chamaemorus (Cloudberry) Seed Oil, Avena Sativa (Oat) Protein Extract, Camellia Sinensis Leaf Extract, Ascorbyl Palmitate, Tocopherol, Retinyl Palmitate, Glycosphingolipids, PEG-75 Shea Butter Glycerides, Lecithin, Zea Mays (Corn) Starch, Perfluorodecalin, Hydroxyethylcellulose, Lauryl Glucoside, Citrus Grandis (Grapefruit) Peel Oil, Caprylyl Glycol, Glycerin, Butylene Glycol, Propylene Glycol, Phenoxyethanol, SD Alcohol 40-B, Dehydroacetic Acid, Benzoic Acid, Ethylhexyl Methoxycinnamate, Sodium Hydroxide, Silica, Cetyl Alcohol, Oleth-10 Phosphate, Glyceryl Stearate, PEG-100 Stearate, Cetyl Ricinoleate, Stearic Acid, Sorbitan Stearate, Polyglyceryl-2 Dipolyhydroxystearate, Sodium Polyacrylate, Acrylates/C10-30 Alkyl Acrylate Crosspolymer, Ethylhexyl Stearate, Trideceth-6, , Laureth-3, Xanthan Gum. I tried a sample of this a couple years ago and as soon as I ran out, I missed using it and ordered more. The smell is somewhere between orange and grapefruit and is a nice way to wake up in the morning. I have combination skin that is becoming more dry as I approach 50, and this moisturizes well and doesn't cause break-outs or irritation. I find that it works best if I put it on immediately after I step out of the shower--while my skin is still damp. My 16-year-old son also uses it to calm both extreme dryness and acne. Great product! my skin is combination type, and it gets red spot, flaky when i came to VA. i tried kiehls ultra cream, origin dr.wells moisturizer.. etc. they just didnt work at all! i saw this fancy package and its discribtion, i think, well, lets tyr it. and then just one day!! no, just half and hour after i applied the cream on my face, i feel totally different!!! it amazed me. 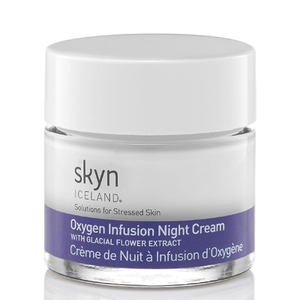 im gonna change all my skincare product to skyn iceland and return the others!!! GREAT PRODUCT!! Love this product: Immediately feels refreshed renewed with a moist and supple skin. The appearance of my skin instantly appears soft and supple. I am purchasing the night version. Worth every penny! I love this face moisturizer. It is just enough, without going into the 'too greasy, too heavy' kind of category. It smells pleasant, and even though it's a bit on the pricey side, I don't use much and that one jar lasts me a very long time. I confess that I liked their old packaging better - it used to come in a frosted glass jar, and it gave the appearance of being a little cloud. Regardless, the product is terrific and, unless you have specific skin problems that need more serious treatment, this cream is great. Dry winter skin doesn't get much relief from this product. All the pros are there but it just isn't delivering on the moisture factor. Expensive for this line of products, of which I am a fan, but after 2-3 weeks improvement doesn't show- and that was reapplying it 2-3-4 times a day. If you don't need too much except a medium moisturizer- this works. Pure Cloud Cream is my favorite moisturizer when my skin gets totally parched. I agree with everyone who loves it for the winter when skin is at its driest, but I've found that it's so fluffy that it's lightweight enough for the summer, too. I haven't had any breakouts or patches of dry skin since I started using it, and my skin looks and feels so smooth.The smell is amazing; I usually don't like citrus-based smells because they are too strong and artificial, but Pure Cloud Cream's scent is super subtle and dreamy.The price is worth it because the cream is so much more luxurious than any other moisturizer I've ever used. It also lasts a long time, and you're not constantly running to buy a new jar. I definitely recommend this product to anyone looking for an incredibly pampering moisturizer. I tried this for several weeks, thinking surely it would start working. Nope, nada. It melts into your skin like water, if you try to spread it on your fingertips first, it disappears to nothing before you get it to your face. My skin kept getting drier and even flaky with red patches. I finally returned it to another store, where I had purchased it. As soon as I returned to my more emollient cream, my skin cleared up. I received a sample of this cream. The consistency is very cloud-like and fluffy. It goes on smoothly and absorbs fast, leaving no greasy residue or shine. After using the sample for 4 days, my skin looked smoother, calm, and, well, happy. I haven't used it long enough to be able to attest to the claims that it heals. I also loved that there was no fragrance. Not sure if it's worth the heftier price tag or replacing my other skin care products, but if you can get a sample, definitely try it.